There's actually two of them for a pair of Space Wolf Dreadnoughts I'm working on now. 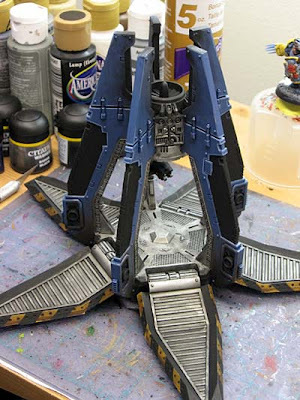 And I thought painting a drop pod straight black for an Inquisitor was tough... painting them to match a Space Marine chapter is even harder. They're great models to look at, but a real pain to try and paint. And a little something I came up with while I was putting the finishing touches on the model today. Made me laugh. Enjoy this little back and forth between two friendly Chapters. Looking awesome. The black on the fins made me think though. 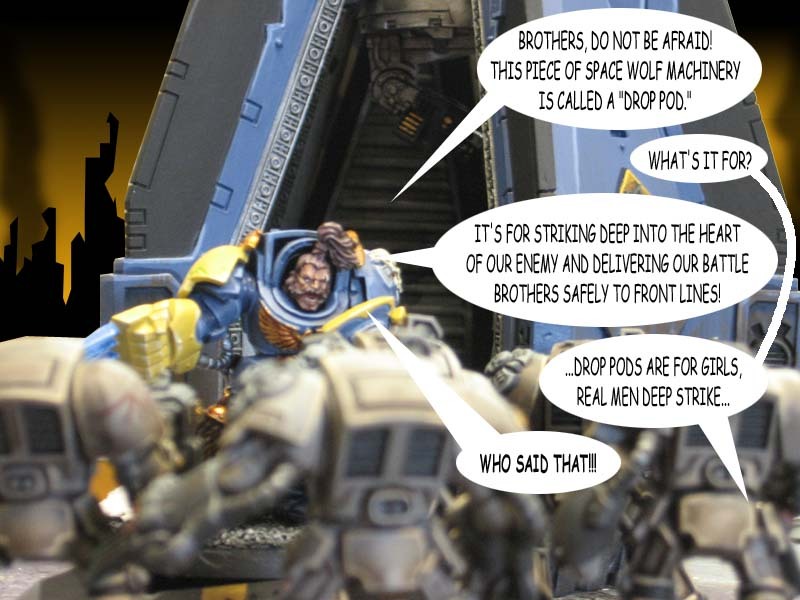 What color would the Space Wolves use as their secondary color? Yellow/Red/Black/White is used on shoulderguards but that feel squad specific (guard, hunters, pups, fangs) so I guess gold could be it. But gold might look odd on such a large area. Maybe black/yellow stripes like on the doors. Yeah, just me rambling:) It would be interesting to hear your thoughts on the subject though. Personally, I went for a distressed metal for the areas that are black on these pods, ymmv. 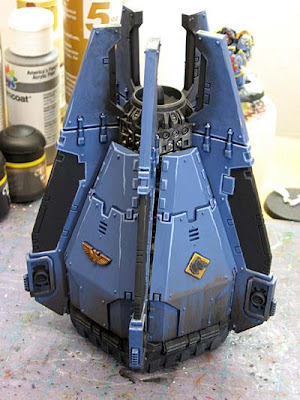 As for the weathering, I'd do the scorching as black on the hottest area, transitioning to brown as you move up the pod. Look sometime at pictures of the Apollo space capsules, you'll see that pattern. Well, what they say apparently *IS* true as Blood Angels terminators can't take drop pods at all. I went from brown to black to bare metal on the bottom to simulate the damage done during atmospheric entry. On the top, I just used black to make it look soot stained and give the indication of the engine up there. I went more for the feeling of it as opposed to complete accuracy. Thats a pretty sweet drop pod. How hard is it to adapt to not putting the internal pieces in? I'm building a pod for a dreadnought, so I don't really have a use for the seats. pdelair: I didn't build it, it came to me already assembled. all I had to do was paint it up in the correct colors. I suspect it wouldn't be too hard to "just leave the internal parts out," but I can't say for sure. I had my drop pods using the same squad markings as the unit its assigned too.